On November 5, 2016, the National Wellness Institute―and the wellness community at-large―lost one of its most devoted advocates and teachers, William B. Baun. Bill, as most of us knew him, was the type of person that whether you knew him well, or just met him briefly, you couldn’t help but take his spark for life and passion for wellness with you. He never tired in his dedication to make the world better by sharing of himself, his knowledge, and his experiences. In his life, writings, and teachings, Bill demonstrated how to embrace the world with joy, gratitude, and endless determination. He focused on thriving and helping others to do the same. A Certified Wellness Practitioner and an active member of NWI for many years, Bill was a member of the NWI Board of Directors from 2003 to 2015, and served as the NWI's Board President from July 2011 through June 2014. Working closely with his longtime friends and colleagues George Pfeiffer and Susan Bailey, Bill helped to develop and lead NWI's Worksite Wellness Specialist and Worksite Wellness Program Manager certificate programs. 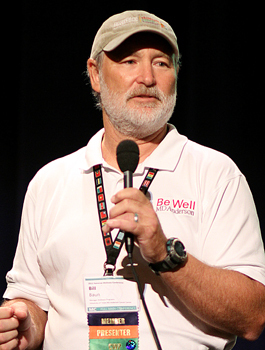 Bill was a constant at the National Wellness Conference for many years, creating the Worksite Wellness Academy with Pfeiffer and offering presentations and personal conversations that inspired wellness professionals worldwide. At the 2014 National Wellness Conference, Bill was presented with NWI’s first-ever Lifetime Achievement Award. In his career, Bill was instrumental in bringing the concept of wellness to the corporate world, serving on various national boards, authoring numerous articles and books, and receiving several prestigious awards for his work and leadership. In 2015, HERO selected him as the Bill Whitmer Leadership Award Winner. In late 2016, Bill retired as Chief Wellness Officer with MD Anderson Cancer Center in Houston, Texas. For those of us at NWI who had the pleasure of working with Bill over the years, we saw first-hand the dedication he had for this organization, and the influence he had here will live on as part of his legacy. In his final years as he learned the progression of his cancer, Bill set a profound example of gratitude, honesty, and strength that inspired countless others who found themselves on similar paths. On his blog, Bill prominently displayed this quote by Wendy Schlessel Harpham: "Life isn't about waiting for the storm to pass, but learning to dance in the rain." Our hearts go out to Bill’s beloved wife, MaryBeth; to his family, friends, colleagues; and to everyone who Bill inspired to promote wellness and, of course, to dance in the rain. In his honor and memory, the annual NWI Lifetime Achievement Award will hereafter be known as the NWI William B. Baun Lifetime Achievement Award. So sad to hear of his passing. He was a true inspiration to us all!!! (part 2 of 4) He was not afraid to live, not afraid to die. For many years he and death were near neighbors. He was always willing and ready to meet and greet this king called death, and for many months he sat in the deepening twilight waiting for the night, waiting for the light. He never lost his hope. When the mists filled the valleys, he looked upon the mountain tops, and when the mountains in darkness disappeared, he fixed his gaze upon the stars. In his brain were the blessed memories of the day, and in his heart were mingled the dawn and dusk of life. (part 3 of 4) He was not afraid; he was cheerful every moment. The laughing nymphs of day did not desert him. They remained that they might clasp the hands and greet with smiles the veiled and silent sisters of the night. And when they did come, Walt Whitman stretched his hand to them. On one side were the nymphs of the day, and on the other the silent sisters of the night, and so, hand in hand, between smiles and tears, he reached his journey's end. From the frontier of life, from the western wave-kissed shore, he sent us messages of content and hope, and these messages seem now like strains of music blown by the "Mystic Trumpeter" from Death's pale realm. Today we give back to Mother Nature, to her clasp and kiss, one of the bravest, sweetest souls that ever lived in human clay. (part 4 of 4) Charitable as the air and generous as Nature, he was negligent of all except to do and say what he believed he should do and should say. And I today thank him, not only for you but for myself, -- for all the brave words he has uttered. I thank him for all the great and splendid words he has said in favor of liberty, in favor of man and woman, in favor of motherhood, in favor of fathers, in favor of children, and I thank him for the brave words that he has said of death. He has lived, he has died, and death is less terrible than it was before. Thousands and millions will walk down into the "dark valley of the shadow" holding Walt Whitman by the hand. Long after we are dead the brave words he has spoken will sound like trumpets to the dying. And so I lay this little wreath upon this great man's tomb. I loved him living, and I love him still. What a loss to humanity and to our Well Being profession. He was a genuine gentleman, a dedicated professional, a magnificent teacher and such a sweet human. Our prayers and sympathies to his wife and all who knew him. I met him as my teacher for the CWWS course several years ago in Minneapolis, and he was instrumental in me wishing to continue to build my career around Well Being. Rest well, good sir, and know your spirit lives on. Bill will always be in my heart. His warmth reached out to everyone with his honesty. He showed us how to be hopeful and powerful in tough times. He was and is a wonderful friend. Bill was a true leader in health and illness and was a fearless example to us all. He will be greatly missed but leaves us with positive examples of living life as a brilliant human being with truth and honor. Much love to Mary Beth and family. It was such an honor to meet Bill in 2015. Inspirational, kind-hearted and passionate are only a few of his attributes. My condolences to his family...he will be truly missed in our wellness community. In his honor, I will always remember to "dance in the rain". Truly a glorious soul! Bill and I had numerous opportunities to have those conversations from the heart and he inspired me in so many ways. You will live in my heart forever Bill! Thanks for your inspiration! Kind, generous, tireless... we've lost a wellness giant and a wonderful person.